Most SEOs have a veritable plethora of tools they use day in and day out for the wide variety of tasks they usually need to concern themselves with. We have tools for scraping SERPs, crawling sites, analysing log files, checking HTTP headers, and about 1 million other things. However, even with all these tools at our disposal I still get asked often about simple ways to check the main social metrics for a page. I don't want to start a debate on what the 'main social metrics' actually are; we are just going to go right ahead and assume that if you know the number of Tweets, Likes and +1s then you can usually draw your conclusions from that. An instant check of the metrics for the current page. A quick check of a short list of URLs which you can do via n easy accessible tool. Check a longer list of URLs which requires more robustness. Continuing my recent trend of throwing together tools for the SEO community to use I've put together 3 tools to help out in these instances. If you are doing serious en masse data collection then you need a more robust solution, and probably already have one; here I'm aiming at filling some of the gaps on the spot check scenarios that SEOs come across in their day to day activities. Ok, Firefox fans, I'm sorry but this solution is built only for Chrome, which an increasing majority of SEOs are turning too and happens to be what I use. I've created a simple Chrome Extension that shows the share boxes for whatever page you happen to be on. This is the first version (and my first attempt at a Chrome Extension) so it needs some polish, but for its purpose it works really well. 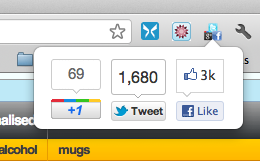 Simply install the Chrome Extension then click on the icon to see the metrics for the current page. It isn't ideal for actually sharing on Facebook or Google+, but works well for Twitter. I might update the extension for that, but beyond that I want to keep it relatively simple. I will warn that it is likely that this tool might sometimes break; it doesn't use a proxy and so everyone who uses it means it hits the social networks' APIs and my server may sometimes get blocked. In these cases you'll have to use the tool below for more robustly checking lists of URLs. I often use Google Docs for checking social metrics, but this I find to be quicker and simpler when I have a short list of URLs I want to take a real quick look at. This is the most robust and flexible of the 3 tools, but requires you to be logged in to a Google account to use, and isn't as quick fire to deploy for small lists of URLs. However when you have a larger list of URLs and/or want to do other manipulation of the data then this is the tool you need. You will find the scripts in the script editor if you wish to edit them or use them in another sheet.